While driving north along Interstate 5 through Northern California, I stopped at a gas station in the town of Yreka. I found this brand of jerky called "Riley's Jerky", and picked up their jalapeno variety. I opened the package, and found it to be rather good. I decided a week later, while driving back home, to stop in at the same station, and pick up a couple more bags to write this review. Riley's Jerky is based out of Greenville, CA. It's been in operation since 1980, and from what I've been able to gather, is still a small family run business. They claim to make all their jerky by hand in their own facility, and advise that while their jerky is a little bit tougher to eat, it has a taste and texture that's superior to most others. Their jerky is largely sold in stores throughout southern Oregon and northern California. They also sell to directly to individuals over the phone. That's kinda what I sensed when I ate that jalapeno variety of theirs. However, I've not tried this original variety yet, so I'm wondering if it'll be any different. Beef, water, soy sauce, garlic salt. The first tastes I get from the surface of these pieces is a salty flavor, that manifests itself into a soy sauce flavor. It's not overly salty, at least not on the surface anyways. I think I can pick up hints of that garlic. Moving into the chewing, the natural meat flavors radiate out in copius amounts. I also get more salty taste. The natural meat flavors in this are well presented, I'd say they make up the dominant taste of this jerky. Those flavors are best enjoyed after letting a piece moisten in your mouth for 15-20 seconds, and then chewing down. It's flavor reminds me of beef stew meat, probably because these pieces are so thick that it looks just like beef stew meat. And for being preservative free (except for that in the soy sauce), it retains a fair amount of freshness. As you'll read below, these pieces are rather dry, but because they are so thick, there's an inner layer of meat that still has some moisture to it. 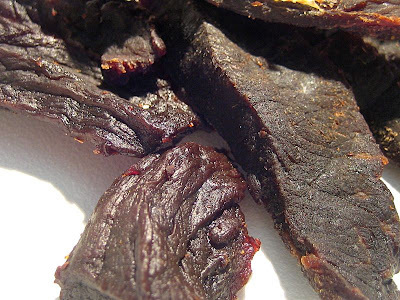 This layer presents a wonderful beef flavor unlike that of the outer layers, and provides this jerky with a great, overall flavor. The second most dominant taste is the soy sauce. I can taste it on the surface, and continue tasting it in the chewing. But even though it's well defined in this jerky, I don't see this jerky as being "too salty", it's just right for my tastes. The garlic seasoning I also mentioned takes the third most dominant taste, but only because there are no other tastes to mention. I don't really taste a whole lot of the garlic, but I can sense it back there as an aftertaste. This is actually a very tasty jerky mostly for its strong natural meat flavors. The soy sauce and slight bit of garlic does well to add some extra level of taste enjoyment. These appear to be chunks of whole meat, cut into very thick pieces, more like large beef stew chunks. 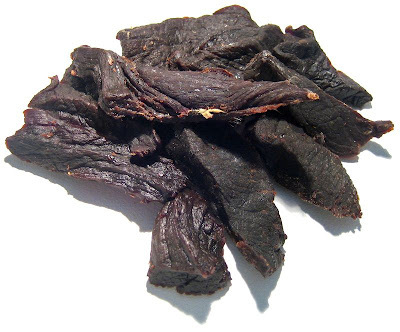 It's actually a very dry jerky, even though the photos below make it appear to be moist. The surface of these pieces have a thin layer of oil that glistens in the light. In fact, being these pieces are so thick, and so dry, it's tough to tear apart. It takes a good amount of effort to tear a piece with your fingers. I actually found it better to use my fingers only, and not my teeth. Chewing is not as tough as long as you allow a piece to rehydrate in your mouth. Once it does, it chews just like a real steak. If you were to chew immediately upon putting a piece into your mouth, it'd be like eating wood. It's a very clean jerky, despite that thin layer of oil I talked about. I don't really pick up any residue on my fingers. It's also very lean. I find no pieces of fat, tendon, or gristle. I paid $5.99 for this 3 ounce package at a Mobil Station in Yreka, CA. That works out to a price of $2.00 per ounce, putting this on the border between expensive and average. For general jerky snacking purposes, it's a decent buy. You'll get a good deal of snackability with its strong natural meat flavors and soy sauce taste. You might even feel more manly shoving these thick chunky cuts of beef into your mouth. If you can find this closer to the $1.50 per ounce price, I'd consider this a bargain. It's largely the strong natural meat flavors that gets it up to a "good" rating. I actually found myself on the line between "best" and "good". I mentioned above that because these pieces are so thick cut, there's an inner layer of meat that still has some moisture to it, and provides a very wonderful beef flavor unlike that of the outer layers. But it's still rather tough to eat, and is why I chose to err on the side of "good" instead of "best". If the seasonings and marinade were any more complex, aside from just soy sauce, I might have assigned a best rating despite the tough consistency. I'd consider this a "meat lovers" jerky, it's got a lot of natural meat flavors, and its thick and chunky size makes an impressionable showing. It also provides that steak-like chewing satisfaction. Everything about this jerky cries out "BEEF!" This is absolutley the BEST Jerky in the West. If you stop by Greenville, you can purchase a pound and save yourself some money! This is HANDS DOWN the best jerky ANYWHERE. I travelled all over the US... searching for decent jerky, REAL beef jerky....no that sugary, over-processed, crap they call jerky and they sell in every gas station. (Oberto, Jack Link, etc) Those should be sold in the candy section, not the jerky section. The less sugar the better. Riley's jerky has BEST flavor his best in my opinion is the PEPPERED. (Black Bag). I have driven over 4 hours (round trip) to pick up over $50 worth of this 'brown gold' before. Its a REAL MANS BEEF JERKY. Someone tell Riley to put his jerky on a website. I bet he would sell 10X more than he does currently. No joking. I have the pleasure to say that I personally know the owners of Riley's Jerky! I have known them if not my whole life, atleast since I was a very small girl! They are close family friends! I also have tried every other jerky out there and I find them all lacking. Riley's Jerky is the best ever!! It is a tough jerky, but "Hello?!" It's called "Jerky"!! Riley sadly passed away in the fall of '99, so his sons and son-in-law run the business now! It's a family run business, which makes it even better!! It is still made the same way he used to back when it was a hobby of his Before he was selling it!! Everytime I go to Greenville to visit my hometown I stop at "the jerky joint" and hang out! So if you're looking for the best jerky in the world, I with out a doubt in my mind suggest Riley's Jerky! I couldnt agree more with all the comments on here...I cant walk into a store without grabbin' a piece. My wife broke a little chunk of her back tooth on it....She stills eats it non-stop! I'm in Montana. I haven't been able to find good, store-bought, reasonably priced jerky here. There are local jerky businesses that make excellent jerky, but the prices they charge make a man want to buy a smoker and make his own. I used to buy Riley's jerky in the pound bags from a distributor in CA, until they quit selling to non-businesses. I love this jerky. No reprocessed chunks of fat, gristle, and maybe-meat here. I would love to be Riley's MT sales rep! I buy 2 to 3 pounds of Riley's heavy pepper jerky a week. I work at a casino and the people there go crazy over it. One guy insists they add something to it that makes it so addicting! HAHAHA! Keep up the fine work gentlemen! Great stuff. Just bought 6 bags ($5.75 each) on my recent trip to Yosemite. Gas station has them right before Groveland heading into Yosemite. Tried the jalapeno and original so far, will have to try the peppered next time! Good quality meat, interesting cuts, no fat/tendons/mess. Ingredients you can feel good about --- no sugar, high fructose corny syrup and other processed garbage. Will have to visit Greenville sometime! Looking forward to trying Riley's Jerky on the trail with my daughter Riley. I'm sure it will be a surprise hit on our first mother/ daughter horse trip. I was surprised to reach a very nice gentleman on a Saturday afternoon, enabling me to place my first order. As others have said, this is THE BEST BEEF JERKY, hands down! I like their peppered jerky best. I've been buying it for about 14 years, and enjoy a bag or two every time I head to Lassen NP. I too wish that you could buy this off the web. I live in Northern California in the town of Chico, and I have been eating Riley's beef jerky since I was a kid. I have bought many different types of jerky throughout California and Southern Oregon, and it is the best store-bought jerky I have ever had. Only home-made jerky I had while working in Montana has beat Riley's. It is the "real deal" when it comes to jerky...no joke. I live in san diego, and am a self proclaimed beef jerkey connoisseur. This is by far the best stuff, its big hunks of meat, dried to perfection and the marinades taste great. I live in Redding, CA. I love there peppered jerky the best. My complaints are that I can't order over the internet, or use a Visa to pay. I would like to know if there beef is organic. As I don't want to consume all those hormones and other chemicals that commercial meat packers use in their product, and I can't find anywhere if they have peppered Turkey jerky. Turkey Jerky is the best if it is peppered. Just tried this while in Truckee, California over Thanksgiving. Sick of turkey leftovers, I snuck into a gas station convenience store while filling up the car and immediately began looking for jerky. The woman at the counter asked me if I preferred hard or soft jerky, and when I said hard, she recommended Riley's. I bought the Cajun variety and the Peppered variety. Both were fantastic, though I would warn anyone with fillings to stay away Anyway, definitely one of the best jerkys I've ever had, and if I see it again, I'll buy more, and in a larger quantity. Anyone know other locations where it is sold in California? P.S. This may be a "man's man beef jerky" as several of you have said, but a true meat and jerky-loving lady like myself must disagree--this is also a woman's beef jerky! I can agree this is the best jerky i have evr tasted! 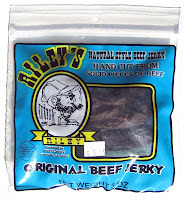 !My son will agree as well.Used to buy it in portola at a little store.Its not over sweetend.My way of expalining it would be it would take 10 peices of normal jerky to satisfy you like one peice of riley's awsome stuff!!!! I just contacted the current owner who is Britt, Riley's son, he says that he is working on a website, but nothing as of yet. I purchased only one bag from the Chevron in Weed, CA. That was 2 years ago and I have been searching for it ever since, now that I've found it. I'll be regularly ordering 1lb bags of this delightful jerky. This is Riley's Jerky here! We now have a website but are not quite set up for online ordering yet. Our site is "rileysjerky.com". Please feel free to visit and learn more about us and look at our products. We will have online ordering up as soon as possible. Our email is bestbeefjerky@rileysjerky.com, feel free to email us regarding any questions or comments. Thank you for all the wonderful reviews! i have found only one liquor store here in hollister that i can buy this. i get a bag a couple times a week. it is hands down the BEST jerkey i have EVER eaten. i agree it's easier to eat if you break it first. i just finished a bag right this minute, still enjoying it!!! thank you thank you thank you!!! It is so cool to do a websearch to see if, by chance, Riley's jerky is still being made, and to find out it is and that so many people still love it! I grew up in the Feather River Canyon in the late 70's early 80's, getting to meet Riley at The Hitching Post and then later getting to buy a piece of his jerky at the Twain store as a treat. I've been sampling jerkies ever-since and none have been quite like Riley's. In fact, I'd just tried a jerky from a local smokehouse in Fort Bragg, CA (Round Man's Smokehouse) and the fondness of trying a local jerky reminded me of Riley's when I was a kid, so as soon as I got home I had to see if I could find it on the web. Now that I know it's still being made, I'll be making a stop by Greenville this summer! I grew up eating this jerkey and no other jerkey comes even close to being this good my favorite choice is the peppered. BY FAR BEST JERKEY EVER. Picked up a bag of Riley's Jalapeno on the way back to Washington State in Alturas, CA at the shell station. Boy am I glad I did. Never thought I would find a jerky in a store that tasted like and had the texture of my mom's long lost jerky recipe. Fell in love with it and I just ordered the 50 piece bag off their website. Man I grew up in Chester then lived in Susanville and worked in Greenville the whole time enjoying the best beef jerky there is. Seriously love this jerky. Now I live in Texas and have to pay shipping just to get it. Totally worth it.